Also Known As: “Keep the Triangle” or “Keep the Y”. This swing thought has you focusing on keeping the ‘Y’ shape formed by your arms and clubs intact early in your swing, i.e., during the takeaway. The image here reflects the fact that when you are holding a club at address, your forearms together form the two upper branches of the “Y” letter while the club itself represents the bottom straight line. The idea is to keep this figure intact during the takeaway. This swing key promotes a correct takeaway sequence that sees no wrist action early in the swing. Indeed, as the club is slowly raised and taken back there should not be any wrist hinge taking place until the shaft is parallel to the ground. Ultimately, this promotes a full swing in contrast to a narrow, or restricted one. By properly delaying wrist action, this swing tip promotes a proper shoulder turn instead, which needs to take place in order to bring the club back at all. And it does so early in the swing, thereby ensuring that shoulders are indeed solicited. Golfers who have a tendency to get wristy, or in other words to solicit their wrists too much and too early will benefit from incorporating this mental image into their swing. Furthermore, golfers who are otherwise prone to developing the yips can also benefit. Indeed, by calming the movements of the wrists early in the swing can lead to calmer wrists throughout the swing and crucially near the point of impact. In the traditional golf swing, wrists should begin to hinge after the club shaft has passed the point where it is parallel to the ground. From that point on and up to the top of the swing, the golfer has a limited amount of time to reach a full wrist hinge. It is therefore common for golfers to cheat and begin the hinge process too early in the swing, resulting in a narrow swing that doesn’t have the amplitude it should. 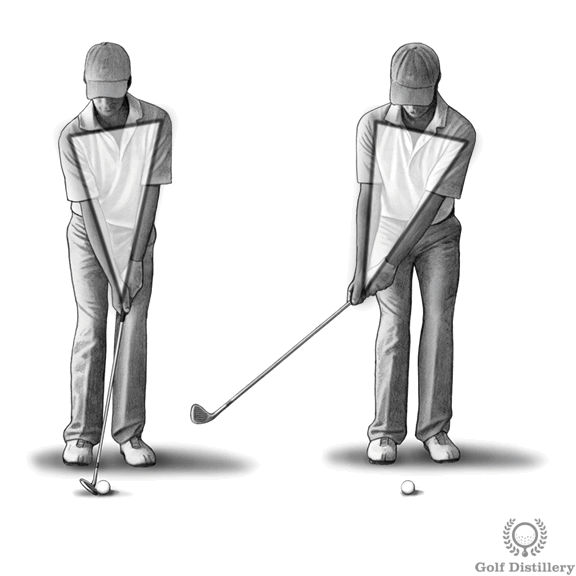 Moving as a block during the takeaway leads your hands and club towards a full swing amplitude and one that moves along using the correct timing of sequences. This mental image can be especially helpful during putting, where no wrist action is sought or necessary. It is also integral to the chipping shot known as the hold-hold-hold. Otherwise, it can be used for most other golf shots. There are certain shots that require you to get wrists to hinge earlier and to break the Y early. For example, the chipping shots known as the hinge-and-hold and the hinge-and-release both require an early wrist hinge. Otherwise, bunker shots can also benefit from an early hinge that favours a vertical takeaway, helpful for a downward strike at the sand.